When it comes to reporting on social media, marketers often get caught up on micro or vanity metrics that rarely give them real insight into the impact their social media initiatives are having on their overall business goals. While it’s easy to spend hours reporting on likes, fans, retweets, pins, or even shares, these metrics alone rarely translate into measurable impact on ROI or brand equity. Social media marketing approaches and goals will inevitably vary by brand or industry. 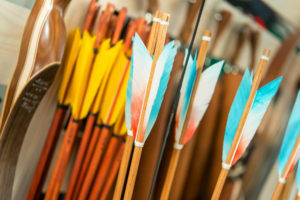 Therefore, the way in which we define the KPIs most reflective of our efforts will also differ, specifically because these should be based on our own unique objectives. A few weeks ago we explored this topic in greater detail with our Partners at MaassMedia. We led a practical webinar focused on creating custom social KPIs to enable you to view the impact of your decisions on outcomes. 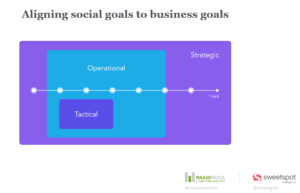 Sweetspot CEO, Sergio Maldonado, spoke on aligning social goals to business goals. Read on for a summary of his presentation. Sergio kicked off his presentation with a question: Do we want to keep reporting on fans, retweets, pins, and shares? Even if we have the time for all of it, is it really useful? If, for example, you are working at a very tactical level, meaning that you are driving a very specific process and working with real time data in order to make sure you are you are optimizing one specific platform or channel, then yes, these metrics would be of some value to you. However, the minute you look at it from an operational or strategic point of view, things start to change. A fan alone will tell you little to nothing of value, but should instead be monitored only in its impact on whatever larger goals are justifying the resources you are allocating to social media. This normally won’t happen at a high frequency, but rather with weekly or monthly updates (sometimes daily as in the Media Industry) in order to allow for sufficient time to react and reshuffle teams or budgets. From a reporting standpoint, it’s essential to create a link between the strategic or operational metrics that you depend on to make data-backed decisions, and the tactical ones that feed into them. In order to do that, metrics must be defined in a meaningful way. We also need to focus on actionability. As an analyst, metrics are used to uncover new insights or hypotheses, and actionability may require the collection of additional data sets around the same metric. Where insights are used to help us make decisions, however, we want to be able to define goals, alerts, or a predictive model. 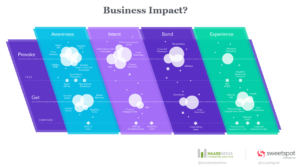 In order to get a clear picture of overall business impact, we need to zoom out and avoid looking at social as a channel-centric effort. Instead, we should focus on the overall business impact we hope to achieve. We’re often dying to prove ROI by channel; however, social is not just another channel. In the end, there are many ways in which social can be used. In fact, there are a variety of options that allow any medium to be social. Every day, our digital assets and properties are becoming more social. Not only because of social logins and social platform plugins, but we keep adding features to share, like, and comment etc. to our mobile apps, retail websites, travel websites, and so on. Furthermore, Voice of Customer and Customer Feedback tools provide additional means for engagement. On the flip side, social media platforms will often perform a basic media function, but can also be used in powerful ways such as extending the reach of remarketing or simple display campaigns. Do those interactions amount to the same sort of engagement? Probably not, as they serve a different purpose. With regards to purpose, Sergio illustrated different goals with the Journey Distribution Flow diagram pictured above. This diagram draws a clear line between the outcomes that you Provoke – this can be called paid media, but it goes beyond the term- and what you actually are left with (what you Get). While we may hope we may be able to map what we get as a direct consequence of what we provoke, in reality it’s much harder to draw these direct links. In light of the impossible nature of attribution, an understanding of where you are today; in terms of Brand reach, branded Traffic, engagement, all falling under Awareness, is crucial. Most truly social outcomes will see the light either on Awareness or Experience. So a custom engagement metric, such as level of effort, can be very useful to rank different pieces of content, audiences, campaigns, etc; it can also be great as a means of understanding how strong the experience we provide is. In the Journey Distribution Flow, we demonstrate a certain linearity in goals, since nurturing awareness will make it easier and cheaper to provoke intent. In any case, Awareness efforts are most closely correlated with Reach. Then we have Intent. Attempting to provoke intent means being there when the need has been identified. You want to be an answer to that Customer’s need. They are not looking for a Brand, but for an answer, and PPC could be an example of an initiative whose outcomes feed into this goal. Bond is about getting a conversion, or forging a relationship. One example could be a newsletter signup, another could be an affiliate campaign. You may also provoke it by using an affiliate campaign. Finally, Experience could also be provoked, for example, through an Influencer campaign. In conclusion, what we can do is map our objectives to both the interactions that we are willing to pay for and the benefits that we obtain both as a result of such paid actions and multiple earned touch points that arise as a consequence of every prior effort. We have plenty of social data out there. As you know, there are loads of metrics within Facebook Ads, Facebook Insights, YouTube Analytics, AdWords, etc. Given that social data access shouldn’t be a problem, the challenge in building a custom engagement metric will almost certainly be in agreeing internally on the definition of this. Once all stakeholders agree internally that the metric does fit your needs, it must be consistently updated for it to be of value. Eventually, what we require is to be able to act on the metrics we are monitoring. We want to reallocate resources based on them. We want to know whether people are doing a good job or not. To identify content and strategies that work best, regardless of platform or channel. If we are able to tie our custom engagement metric to a goal, or see how it does over time and react to crises or opportunities, then we know we have accomplished such business impact. Interested in learning more? 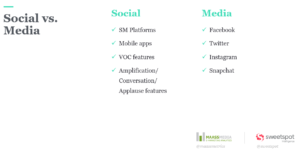 Download the full webcast or check out MaassMedia’s Analyst-approved tips for defining a Custom Social Media Engagement Rate.